An 82-year-old world record was broken in Arlington last night. 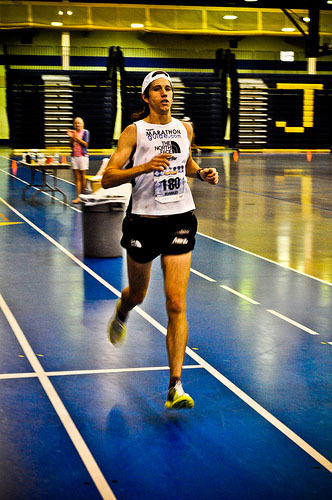 Michael Wardian, an Arlington resident and one of the country’s premiere distance runners, crushed the world record for an indoor track marathon, completing the 26.2 miles in 2:27:21. The old record was 2:34:54, set in Boston back in 1928. Wardian set the record at the Thomas Jefferson Community Center, which has a 200-meter soft urethane track. To complete the marathon, he had to run 211 laps. Wardian, who works as an international shipbroker in Georgetown, is no stranger to setting records. He set the world records for fastest marathon while pushing a baby stroller and fastest marathon on a treadmill, but both of those records have since been broken (“I hope to get them back soon,” he told us). Wardian says he enjoyed setting this record so close to home. “It feels great and I was so happy to be able to do it at Thomas Jefferson Community Center… close to my house in front of my family and friends,” he said. Pool photo taken last night by Chris Rief.